Monomoy Girl almost always makes it interesting. She also almost always wins. The sensational but quirky 3-year-old capped a dream season in winning the $2 million Longines Breeders’ Cup Distaff by one length against fast-closing Wow Cat on Saturday at Churchill Downs. Monomoy Girl ran down pacesetting Wonder Gadot but then, as is her wont, she began to act as if her job was done, much to the exasperation of jockey Florent Geroux. The fast but mercurial daughter of Tapizar got there for the sixth time in seven starts this season and earned her fifth Grade 1 score in behalf of Michael Dubb, Monomoy Stables, The Elkstone Group and Bethlehem Stables. Her somewhat erratic behavior caught up to her but once, when she drifted in the stretch and was disqualified and placed second to Midnight Bisou in the Sept. 22 Grade 1 Cotillion Stakes at Parx Racing, one start prior to the Distaff. Monomoy Girl’s previous Grade 1 successes this season came in the Central Bank Ashland Stakes at Keeneland, the Longines Kentucky Oaks at Churchill Downs, the Acorn Stakes at Belmont Park and the Coaching Club American Oaks at Saratoga. The Distaff surely clinched an Eclipse Award for her as the top 3-year-old filly in North America. That honor, when it comes, may not do her justice. At least not in the mind of Dubb. 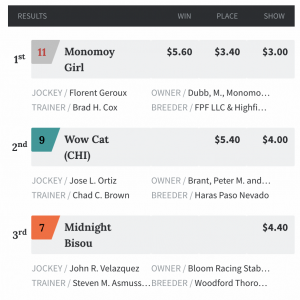 Monomoy Girl won for the tenth time in 12 career starts. She completed the mile-and-an-eighth distance in 1:49.79 as the 9-5 favorite. Rival Midnight Bisou came in third. Successful trainers can often point to one horse that was a difference-maker in their careers. 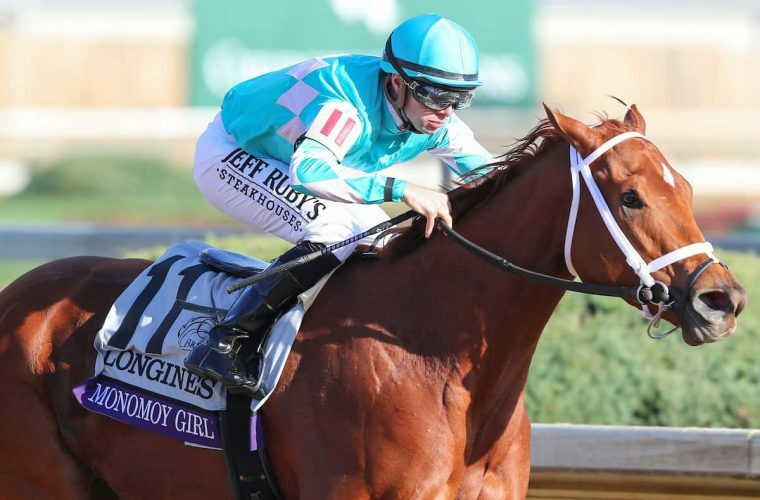 Monomoy Girl is that horse for Brad Cox, who all but grew up in the shadow of Churchill Downs and had never conditioned a Grade 1 winner before this year. The ownership group attributed much of Monomoy Girl’s success to Cox. Many horses tail off as the long season begins to take its toll. Monomoy Girl seemingly thrived on an arduous campaign that began at Fair Grounds in mid-February. “This fall, she’s gotten bigger, stronger and faster, without a doubt,” Cox said. With Monomoy Girl, the possibilities indeed seem endless.